HI, I wold suggest you get some plants to add color and soften the look. 4. Love your dining chairs, but if there are only four and it looks like the table can accommodate six chairs, then you could do with a couple more but not in white. 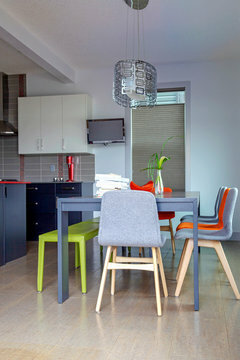 Get two more chairs in the same or a similar style, but in orange (or blue if you want a more muted look e.g. Freedom's Brandon dining chair: http://m.freedom.com.au/furniture/dining/dining-chairs/23437432/brandon-dining-chair-turquoiseoak) sounds out there, but mix-match dining chairs are very much on trend. 5. The exposed brick wall actually works really well with your colour scheme, but break it up with some floating shelves on one side (black/charcoal so the tv doesn't stand out so much, or just a natural timber to tie in the orange) for photo frames, books, objects, ferns, etc and one the other side create a nice little vignette of similar items on top of a cabinet noting to pick colours from the palette. Great suggestions @pazz ! I would also look at maybe wall mounting your TV, that would free you up to do a lot more with your brick wall which seems to be a feature. 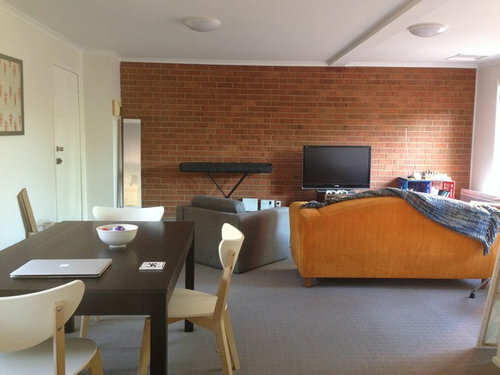 I like the brick wall but it needs colour as it is so close in colour to the couch. Maybe abstract canvas with bright dark blue ,a dash of white and small amount of orange to tie in with the couch. I think use only 3 colours as too many colour confuses things. I think Pazz has good advise. Plain blue cushions and a few with pattern and texture on couch. I would move the furniture around a bit and zone it with similar art work in dining area to tie in with the canvas on the brick wall. Aline the couch with the tv which could be placed on the wall or surrounded by shelves. The dining table is very swish but needs something more decorative on top,maybe a plant with a bamboo runner. Don't over do it with bits and pieces leave it simple. Hi, I think Pazz has nailed a solution for your rooms. 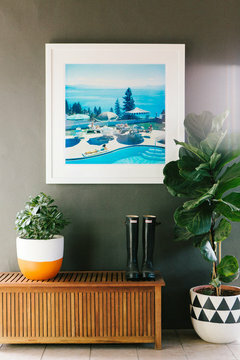 Re art work, I have a website that shows Styling with Art. 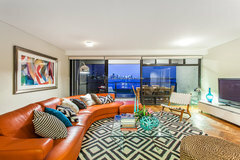 How do we arrange our lounge room?! How do I bring this house to life? How do I make my open-plan room more contemporary?